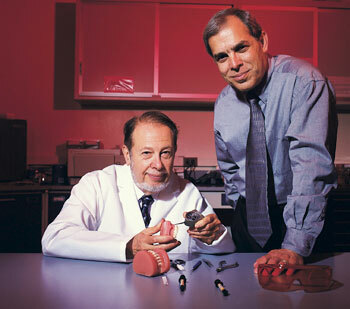 Charles Burstone, seated, professor emeritus of orthodontics, and Jon Goldberg, professor of oral rehabilitation, biomaterials, and skeletal development, invented FibreKor, a material used in dental bridges and crowns. The product was named one of 25 innovations that changed the world. A product invented by two Health Center faculty members and manufactured by a Connecticut company has been named one of 25 innovations that changed the world. The Journal of Human Rights, a major international scholarly publication, will be based at UConn now that Richard Hiskes, professor of political science, has been named editor. The Higher Education and Employment Advancement Committee of the General Assembly last week unanimously approved a bill that would expand oversight for UConn 2000, while maintaining the University’s day-to-day responsibility for the program. University officials are increasing the fine for parking illegally in a handicapped parking space to $131, the maximum allowed by state law.